Coronado Heights was willing to take my husband. The rooms were not very large and felt like motel rooms. The people who assisted me were very nice, very outgoing, and assured me that they would take my husband. I paid out a deposit, but then, they went to evaluate my husband who was in the hospital, medicated, and restrained because he wanted to leave, and the gal told me that she did not know if they could take him. She said if he was going to be violent, they could not have him. I told her he was not violent. It was an incident that escalated because the young caregiver who was inexperienced handled him incorrectly. She said if they had to restrain him, they could not take him. Jun 18, 2018 | Reviewed by Mary W.
My husband lives at Coronado Heights. I've never been unhappy with anything they've done. They take very good care of their patients. They have activities every day for the people in memory care. They have a van and they take them out for drives once or twice a week at least, they have social things, and they have musicians who come in to entertain them. My husband is always clean and they do a very good job. The staff is nice, pleasant, and helpful. They have a board every day with activities that they're going to have. The food is not terrible, but there's a lot of repetition. The place is very highly rated, and it's a pleasant place with outdoor areas. Our experience at Coronado Heights is very positive, and we're very happy with it. The staff has an excellent work attitude. My mom is in memory care. The dining area is very clean. The food is not excellent, but it's fresh and nutritious. Coronado Heights was OK, but I didn't really like the people that much. The facility was nice and pretty. The food, dining area, and menu looked OK. They just didn't have enough people. Hi there,Thank you so much for taking the time to stop by and tour our wonderful community. We appreciate you taking the time out of your day to come and see us. Since we have not been open for too long our community is growing each month. We are sorry you feel that there were not too many people around but as we grow each month that should change as well. We would love to have you come back in a few months and hopefully by then we will have grown even more and have more deserving residents that we can provide care to. Thanks again and please do not hesitate to contact us if you have any additional questions. The best way to get to know a community is by scheduling a tour. See the facilities, meet the staff and residents, and get a feel first hand what it's like to live at Coronado Heights Senior Living Assisted Living. 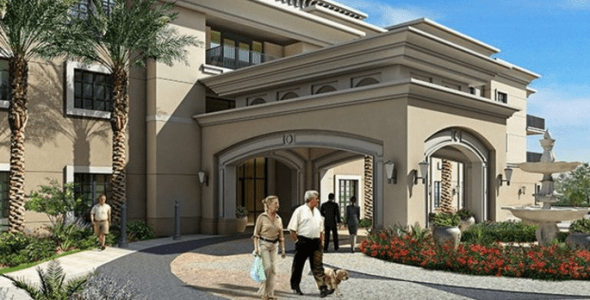 Opening this summer of 2016, located in Henderson/Las Vegas market Coronado Heights Senior Living is a community that provides homelike environment. Our goal is to provide person centered care for our residents. Our caring and highly trained staff are committed in providing the best care and assistance to our residents and build meaningful relationships with them. Coronado Heights Senior Living Community provides services for residents needing both Assisted Living and Memory Care. Our staff will provide individualized care plans that will be uniquely tailored for each resident. Our beautiful new community contains 79 apartments which has a variety of floor plans to choose from. We have studio apartments, one bedroom, two bedroom and companion suites all equipped with kitchenette, and bathroom with walk in shower. We want to develop meaningful relationships with our residents and their loved ones to provide residents centered care. Our trained professional caregivers and staff are always ready to provide assistance whenever you or our residents needed it. To ensure you are always healthy and you are on time with your medicines we have a medication management program to assist you. If you need to go to your doctor’s appointment or have an errand we have scheduled transportation services at you own disposal. We also have daily activities that are enriching and promotes socialization to our residents.